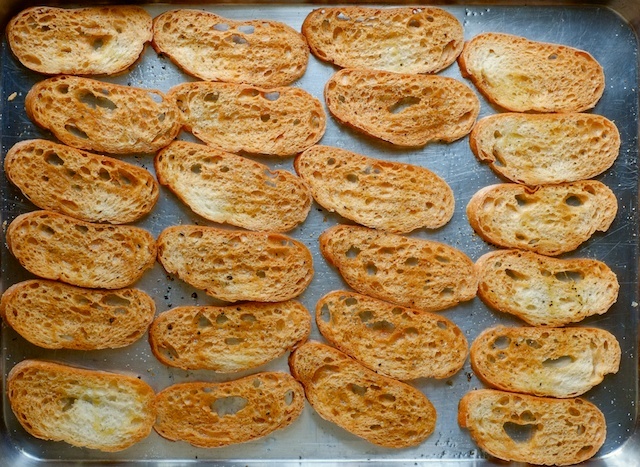 Crostini are one of those foods that are stupidly easy to make, but sadly underused. I love them because I’m a dip fiend, and these pretty little toasts turn any dip into a fancy appetizer. Everything just feels more grown up with crostini. I don’t mean to insult your intelligence by posting such a simple recipe, but I don’t want to assume everyone already knows how to do it. You’ll see what I mean. Dead. Simple. The most important thing you need to make great crostini is a sharp bread knife. You want your slices to be about 1/4 inch thick, so they’re easy to crunch into. If your bread is a little bit stale it will be even easier to get uniform slices, but it’s not necessary if you’ve got a good knife. And really, you can make crostini out of any bread you want. 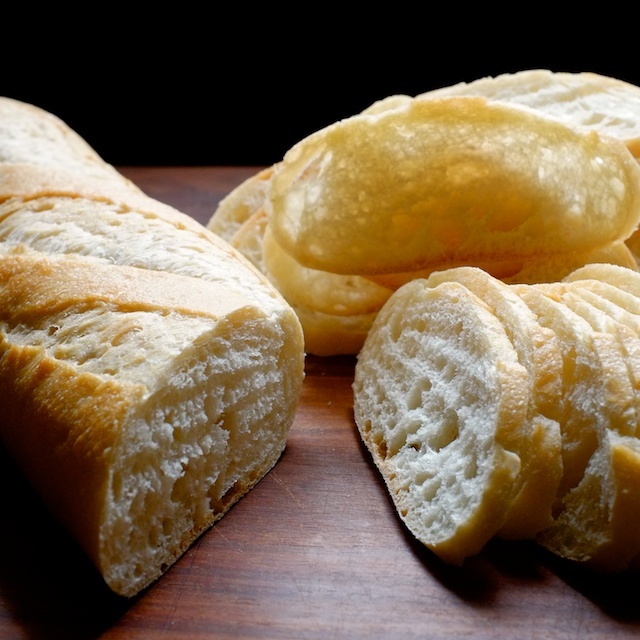 I like to use baguettes because I think they make nice chip-sized bites, but you can use the loaf that goes best with your dip, as long as you cut them into about two-bite pieces. It might be a bit more difficult to slice a large loaf into thin slices, but if you let it get a bit stale you’ll have a better time of it. So toast up some pumpernickel triangles, bagel chips, even three-cheese focaccia slices – they all behave similarly in the oven. 1. Preheat your oven to 375 Fahrenheit. Some people like to go hotter, and that’s fine, but I find I get a more even result at a lower temperature for a slightly longer time. 2. 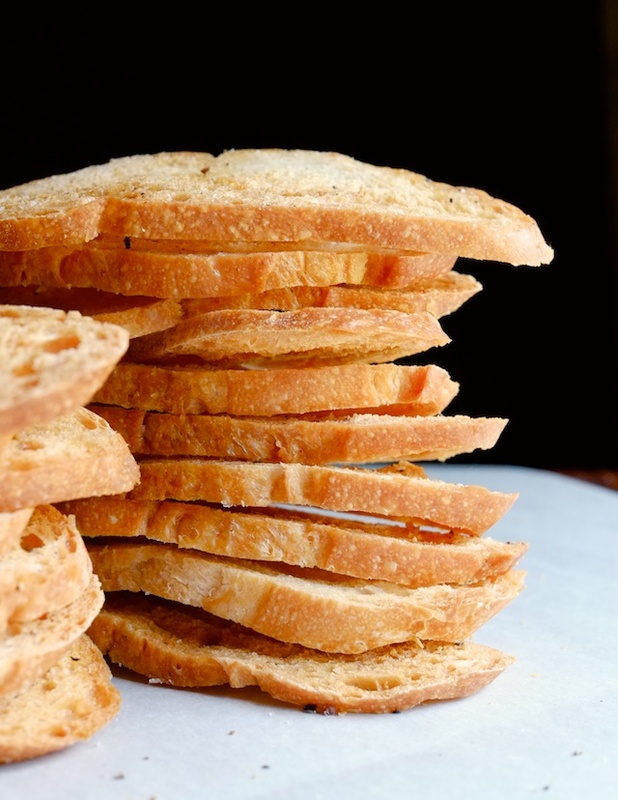 Slice your bread into 1/4 inch thick slices, as evenly as possible. 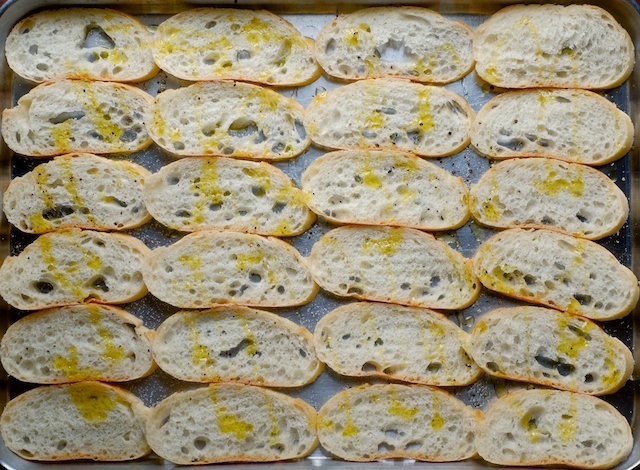 Line them up on a baking tray and drizzle them with olive oil or melted butter. Sprinkle with salt and (if using) pepper. 3. Bake your oiled bread slices for 15-20 minutes, until golden brown. Things brown up quickly between the 15 and 20 minute mark, so turn on your oven light and keep and eye on them. Allow them to cool, and store in a zip-top bag for up to a week.